Chairman and CEO, Apple Inc.
↑ ೧.೦ ೧.೧ ೧.೨ "Smithsonian Oral and Video Histories: Steve Jobs". Smithsonian Institution. 1995-04-20. Retrieved 2006-09-20. ↑ "The Walt Disney Company and Affiliated Companies - Board of Directors". Walt Disney Company. Retrieved 2009-10-02. ↑ "Putting Pay for Performance to the Test". New York Times. 2007-04-08. ↑ "Apple again pays Jobs $1 salary". CNET News.com. 2006-03-13. ↑ "Jobs' salary remained at $1 in 2005". AppleInsider. 2006-03-14. ↑ "Steve Jobs banks his $1 salary, loses $500m". The Independent. 2009-01-08. Retrieved 2009-10-02. ↑ "The Forbes 400 Richest Americans 2009". Forbes. 2009-09-30. Retrieved 2009-10-01. 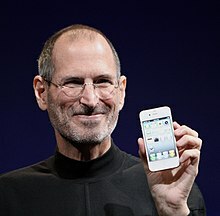 ↑ "#189 Steven Jobs Forbes Richest 2008". Forbes. 2008-03-05. Retrieved 2009-10-02. ↑ "Steve Jobs: Died Buddhist, Raised Lutheran". Archived from the original on July 28, 2012. ಈ ಪುಟವನ್ನು ೩೧ ಜುಲೈ ೨೦೧೬, ೦೫:೧೪ ರಂದು ಕೊನೆಯಾಗಿ ಸಂಪಾದಿಸಲಾಯಿತು.